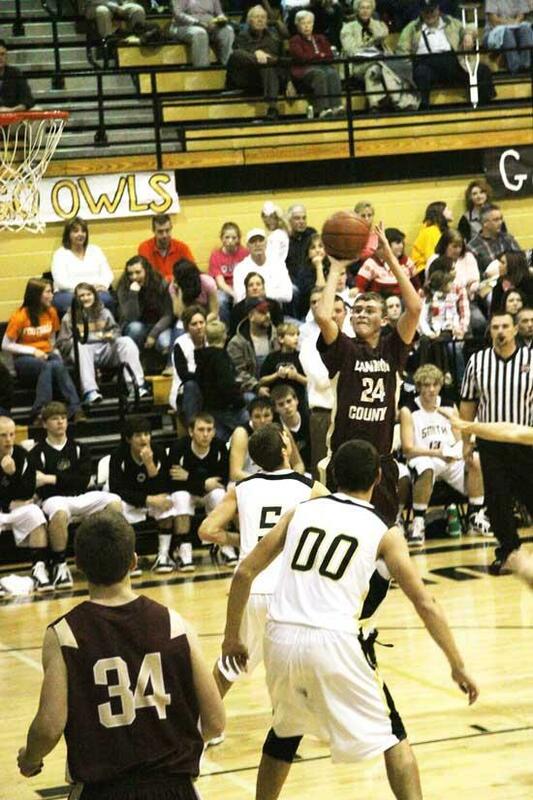 Senior Jared Nave, 24, pulls up for a 12-foot jumper against Smith County Friday. Nave the Lions suffered a narrow road loss against the Owls. Cannon County High's basketball teams gained a split in District 8-AA action at Smith County Friday night. Sharing the basketball led to an improved shooting percentage and kept the high-octane offense going as Cannon County's girls answered their first league road challenge in a 65-35 win at Smith County. The Lionettes (9-1, 2-0 8-AA) had assists on 18 of their 25 field goals with Abbey Sissom, Emily Sissom and Abby Jakes combining for five each, and Cannon County shot 49 percent (25-of-51) to roll to the road win. Experience and depth are supposed to be strong components of the Cannon County boys basketball team but leadership and a deep bench did little to help the Lions in an excruciating 59-56 loss at Smith County. Experienced players were guilty of careless turnovers against Smith County's 2-3 zone and Cannon County's bench was outscored 7-0. It was the third straight road loss for the Lions. See next week's print edition of the Cannon Courier for full reports on both games. District game at Smith- hard place to play! They'll get it together. I know. Hopefully they'll hit their stride at the right time. But as of now, go throw some snowballs at each other.